The problem with moviemaking today is that most filmmakers don’t have the guts to make something unique, ambitious, positive, inspirational, or important without being attached to the words “true story.” We spend all of our time complaining about sequels on the Internet, but when a director has the guts to do something special and original we shoot them down with cynicism. There are already many doing that exact thing to Brad Bird’s ‘Tomorrowland’. Well, don’t believe the cynics, because you are in for something special this Memorial Day weekend! ‘Tomorrowland’ is everything you could ever want in a movie and then some. It has wonder, spectacle, action, mystery, great characters, huge emotion, and sequences that will literally have you cry with joy. It has a message that is so important for every kid to grasp on to and use as a beacon for the kind of change this world needs. It’s a story about reaching for the stars again and it’s hopeful that the next generation can dream like the previous generation couldn’t. In other words, this is the kind of movie that movies were made for. I’d like to say that from the opening moments of the movie it is absolutely perfect, but not many movies are and this is no exception. It opens with a bit of a voiceover by George Clooney’s character (Frank Walker) that is interrupted by Britt Robertson’s (Casey Newton) for being too negative. This whole odd back and forth only goes on for about a minute before we are whisked back to the 1964 World Fair and one of my favorite sequences in recent movie history. We are then introduced to a young girl named Athena (Raffey Cassidy), who hands Frank a small pin and tells him to follow her. Where she leads him is a world that is so magical it left me breathless and honestly in tears from the sheer joy I was experiencing on the beautiful IMAX screen. 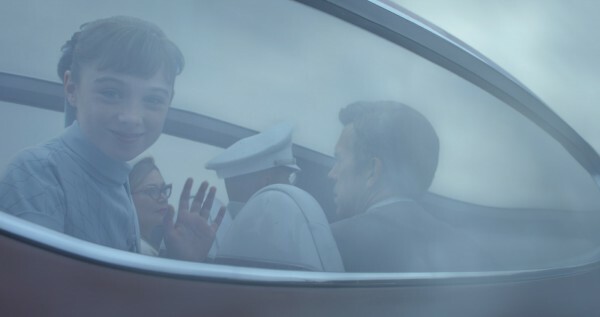 Frank’s introduction to the world of Tomorrowland is something quite special, but it’s only a glimpse. If you want the full walk through then you have to wait for young Casey to finally give you an amazing tour of wonder. The story bounces forward to present day and Casey is trying to keep NASA from shutting down Cape Canaveral. After being arrested, she also finds one of the pins that Frank was given and it gives her a brief glimpse at the amazing dimension of the future. When she finally gets her full trip into the world, it is absolutely awe inspiring. The sequence is all done in one shot and the things she sees are going to make every kid who sees this movie smile with glee. However, this was only a glimpse of the world of tomorrow. From that point on, the movie is all about Casey’s journey to get back to Tomorrowland and figure out what happened to it. This journey will have her cross the paths of Athena and a grown Frank to find the answers she’s seeking. And while Frank may be very reluctant at the beginning, his reawakening becomes one of the films many heartfelt moments. Every one of the three main characters is given ample time to grow and develop over the course of the running time. We get to know who all of them are and understand why these people are special (if you can’t then you are blind). The chemistry between all of them is also quite nice and the film really gives you something deep to care about as you move into the home stretch. The film may be shrouded in the mystery of what happened to Tomorrowland, but at its core it is exploring these characters and something much deeper. The final act has oddly been disappointing about half this countries jaded and very narrow minded critics. There is certainly a bit of dialogue when it comes to the answers, but I don’t buy into the show and not tell philosophy. In real life we tell people what’s going on. Answers come from the lips of human beings far more than from a word that points to a clue and then leads to a chamber of secrets. In life there is usually someone with the answers and you just need to drag it out of them. You also might argue that the ending is filled with some politics that could be off putting to some. I also have a hard time with this notion. There are certainly some deeply held views in this film about the way the world has gone and the way the filmmakers believe the world should go, but that is part of what makes this film so great. By the end of the movie, if you believe that we can change the world and that children should be able to get excited about the future then you will be sated. What this movie is really trying to do is point out what it is that’s gone wrong with our society and show us that there is a better way. We have fallen into a routine of negativity about the planet we live on and the universe we reside in. ‘Tomorrowland’ wants us to be inspired again. It wants us to reach to the sky and see the possibilities that lie in the stars. It wants us to look at science and technology as a way to transform the world into something better, safer, cleaner, more beautiful than we could ever imagine. Or could we? This movie tries to imagine a world of tomorrow that could truly transform the world of today. And it is a world that I would die to get into. I would work as hard as I could to make this world the world of Tomorrowland. I hope that enough kids see this movie and feel the same way. My son will certainly be one of them. He has already grabbed up his Tomorrowland pins and passed them out to his family. He is already telling me how he wants to be a NASA engineer and do something to change the world. I hope his inspiration continues. Luckily, ‘Tomorrowland’ will always be there for a little pick me up if he gets down. Thanks Brad Bird.